Cotati’s octagonal downtown plaza is one of just two in the United States. Bordering Rohnert Park just off Highway 101, Cotati is roughly equidistant – less than 10 miles – from Santa Rosa to the north and Petaluma to the south. With about 7,400 residents according to the latest estimate from the U.S. Census Bureau, Cotati is the least-populated incorporated community in Sonoma County. It also has a diminutive geographic footprint, covering just less than two square miles. 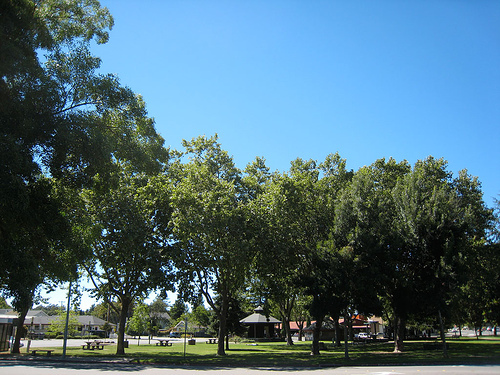 Cotati’s unique, hexagon-shaped central plaza — one of just two in the United States — remains the heart and soul of the community and is surrounded by restaurants, shops, and pubs. Designed in the 1890s by surveyor Newton Smyth and designated a California Historical Landmark, the hexagonal patch of land includes La Plaza Park, the setting for a variety of festive events throughout the year. La Plaza Park hosts the annual Cotati Accordion Festival each August, as well as the Cotati Jazz Festival, a free event typically held on Fathers’ Day weekend. Residents of all ages enjoy Cotati Kids’ Day Parade & Festival, an Oktoberfest celebration, and a Christmas tree-lighting ceremony, all of which take place in the downtown plaza. Cotati was a hotbed of counterculture and music in the 1960s, and that spirit lives on to this day. Establishments like Friar Tucks Pub, Redwood Cafe, and The 8 Ball host a variety of acts on many weekend nights, with both locals and students at nearby Sonoma State University in attendance. Restaurants surrounding the city center serve up a smorgasbord of cuisines, including Mexican, sushi, pizza, and barbecue. Although Cotati does have a few national chain stores — including a Starbucks, a Walgreens, and a Lowe’s — most merchants are of the mom-and-pop variety, and that’s just the way long-time residents like it. A notable Cotati institution is locally owned, environmentally conscious Oliver’s Market, where tight-knit neighbors gather to shop, grab lunch, and socialize. Children have several green spaces in which to romp, including Helen Putnam Park, Cator Field, and Kotate Park. Rancho Cotati Little League, which also plays games in the neighboring cities of Petaluma and Rohnert Park, is also a popular pastime with local youths. Homes in Cotati are currently selling quickly, thanks to high demand and low inventory levels, says one of Pacific Union’s top Sonoma County real estate professionals. According to MLS data, the median sales price for a single-family home in Cotati was $497,500 in January, a year-over year increase of 16 percent.